Our Peterborough Apartments are next to the City Centre with private parking, housekeeping services and 15 minutes walk from the main East Coast line station. They're great for business travellers, couples, solo adventurers, families (with children of any age) and the less able bodied. 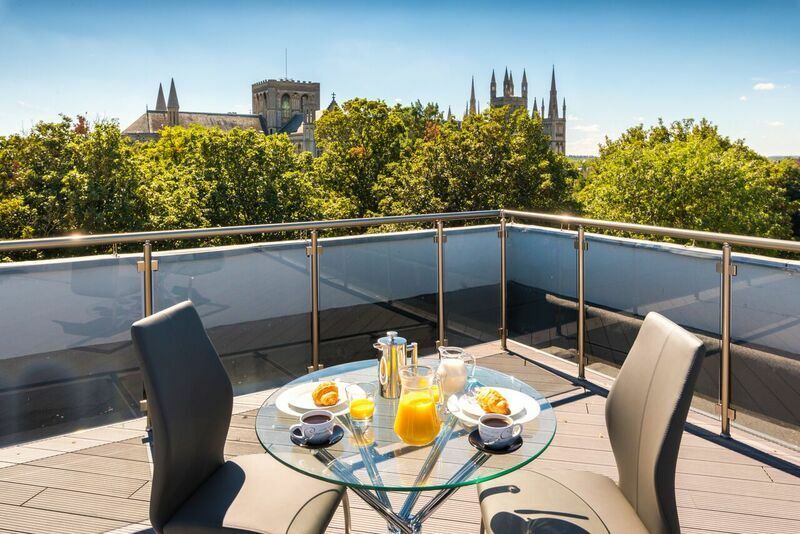 Our 1-2 bedroom apartments, and terraced penthouses overlooking Peterborough Cathedral, are part of a professionally managed, residential building recently converted to a high standard. Your apartment has bed linen, towels, TV, internet, washing machine and hair dryer. The kitchens are fully equipped with dishwasher, oven, hob and microwave oven, plus crockery, cutlery and the usual cooking utensils. Lift access is to all floors except the penthouse suites. Access is by key to the common area, parking, gardens and apartment provided by the Housekeeper on check in when you will be invited to sign the Guest Register. Text or call the Housekeeper on the mobile/cell number provided with your arrival time. Access to the private car park is controlled with your keyfob. One of the most amazing stays I have had! This flat was amazong! the space was perfect, the views were perfect and the location was spot on. Vrij nieuwe woning met mooi uitzicht naar drie kanten. met 2 slaapkamers en 3 badkamers.